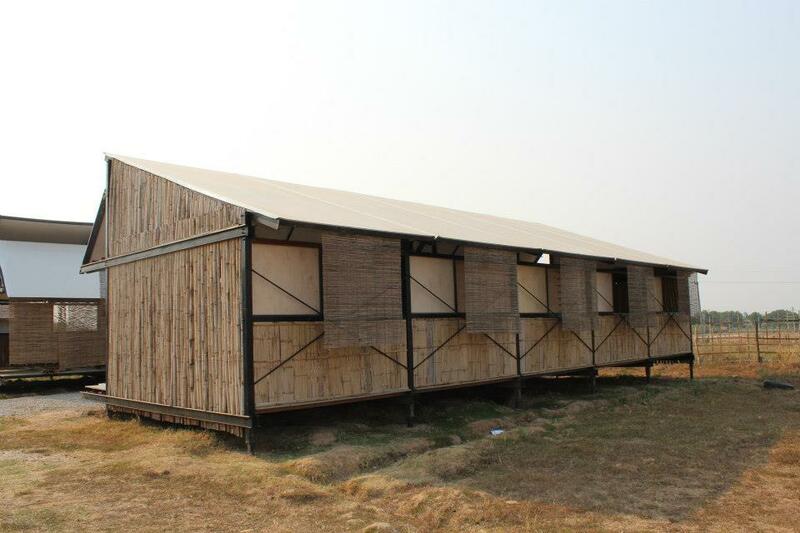 I am very happy to share with you an update live from the Thai/Burma border with details of the progress of the first Moving Schools project at Thu Kha Hang Sar school. To prepare the school for the upcoming rainy season, we have re-recruited the team from Iron Wood part of the Youth Connect social enterprise to carry out necessary metal and wood work on the school site. In order to ensure the building is water tight we will be adding additional wall structure to the school which will also provide extra security. We are currently installing a steel frame to the outside wall panels. The steel frame contains a section with a built in white board which will be of great benefit to the teachers. The Iron Wood team are also installing a window for each classroom which can be opened and closed by a clever pulley system. The additional steel frame window structures will ensure the internal structure is rain tight. The great benefit of the pulley system windows will allow the classrooms to maintain cool air circulation whilst also giving added protection to the building. Wooden panels have been added to the current floor boards to allow the wood and bamboo wall panels which were made last Summer to sit along the corridor of the school. 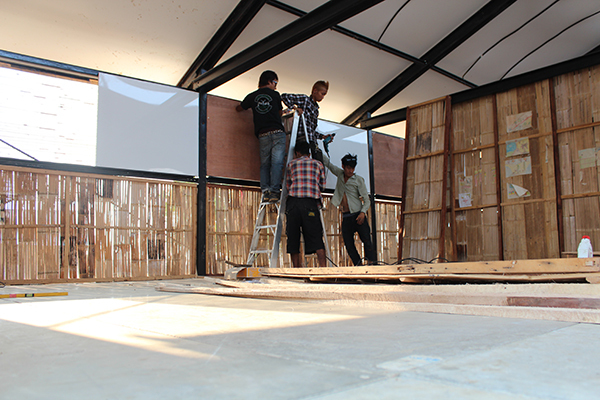 These panels can then be taken down in dry season to create the current open plan design. Adding this feature will allow the teachers to have dual purpose classrooms which can be closed off in rainy season and open in dry season. Please look out for my next blog post which will detail the window pulley system design and photos of the finished school. After writing about the amazing concepts that winning and short listed students delivered in the Building Trust Cambodian Housing competition, I wanted to share with you an interesting TED talk. 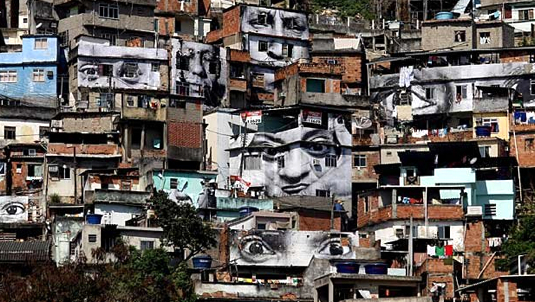 The talk by street artist JR, who won the TED prize in 2011 came up with an innovative art campaign called ‘INSIDE OUT’. 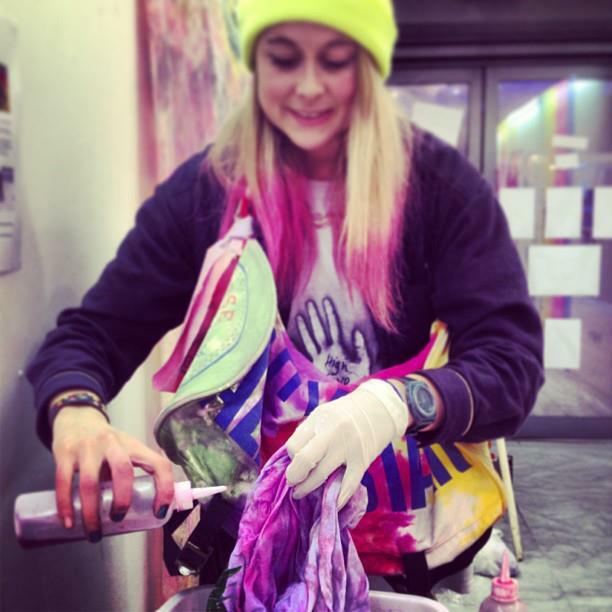 INSIDE OUT is a large-scale participatory art project that transforms messages of personal identity into pieces of artistic work. People are challenged to use black and white photographic portraits to discover, reveal and share the untold stories and images of people around the world. These digitally uploaded images are then made into posters and sent back to the project’s co-creators for them to exhibit in their own communities. 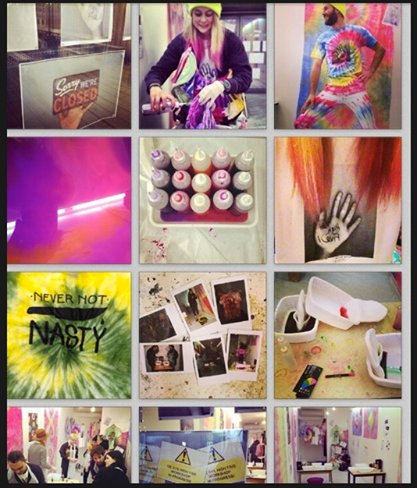 In the video JR, discusses the results of his year long campaign promoting art and design throughout the World. It is amazing to see the volume of widespread participation from every day people, from the favelas of Brazil to the rooftops of Kenya and the streets of Palestine – the project creates global communication. 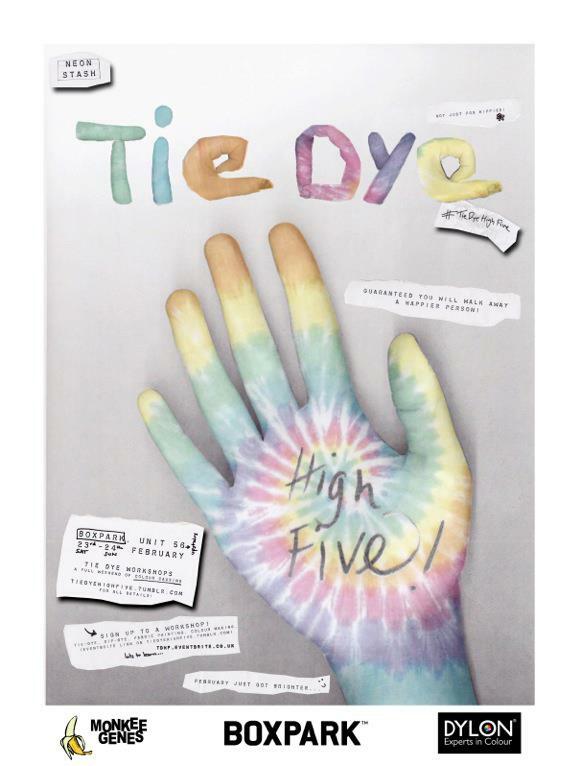 What really interested me after watching the video is JR’s idea that more schools should be getting involved in exciting art and design projects such as INSIDE OUT. I agree with JR that there should be more projects like his or perhaps like Building Trust‘s design briefs within school curriculum. This is a great way to promote humanitarian design. Well enough from me, check out the video for yourself and see what you think. Perhaps you have sent a photo to the project and glued it to a wall in your neighbourhood? If so good for you! Thanks for reading! Oh and also a huge thanks to our 6500th member who joined the Building Trust Facebook page yesterday! Help us get to 10,000 followers by clicking ‘LIKE’ on our page today!! Low income families provided the opportunity to choose their own home design. As I aim to promote humanitarian design within Universities and Educational Institutions it was fantastic to see a variety of concepts from students from countries around the World. It was easy to see from the results of the competition that by setting a challenging competition brief to a student group peer learning can be promoted and an increase in high quality designs and thought process will occur. It was great to discuss with proactive University professors who were very happy to set this challenging brief to their students as part of their curriculum. I hope through sharing the results, we will be able to connect with more Universities in the hope to set further humanitarian design briefs to students around the World. I am proud to announce the winning team from the Student category as Sanaz Amindeldar from Tehran University, Nastaran Hadidi from Isfahan University of Art, Ehsan Naderi from Islamic Azad University North Tehran Branch and Siamak Khaksar from Shahid Beheshti University. 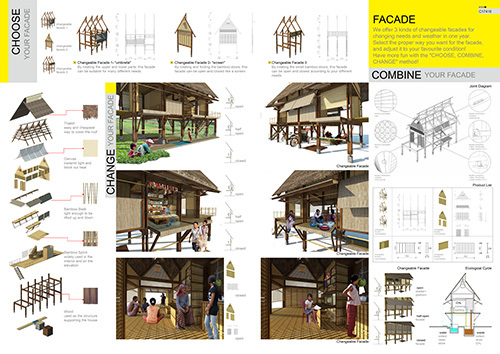 The Iranian team created a modular housing system, with different arrangements of modules allowing the Cambodian family to design their house based on their needs and tastes. ‘Litter of Life’ by Zhang Zhiyang and Liu Chunyao from Harbin Institute of Technology, China came up with a design using recycled materials to create a new housing solution. 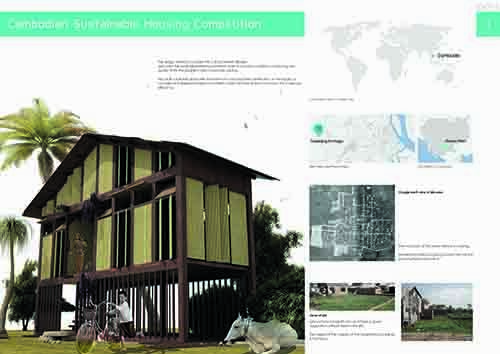 ‘I-Home’ by ZHAO Jingxian, CHIONG Zhimin and QIU Lidan from Tsinghua University, Beijing, China. ‘I-Home’ by ZHAO Jingxian, CHIONG Zhimin and QIU Lidan from Tsinghua University, Beijing, China. Instead of a single housing design the team offered a housing system which the user could choose different facades and interiors. ‘C-House’ by NAN TIAN, QIN LING, QIU PEIRAN and CHENG KUN from Tsinghua University, Beijing, China. The team aimed to create a better housing model with changeable structures through the use of modular units which are applied to fit various conditions, assembled free and built fast. ‘semi H House’ by Cai Zeyu, Chen Fengqian, Yang Tianyu and Liu Qun from Tsinghua University, Beijing, China. 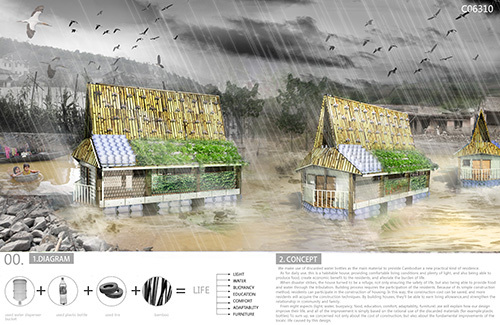 The team hoped to create a sustainable house incorporating environmental-friendly features for low income families in Cambodia. 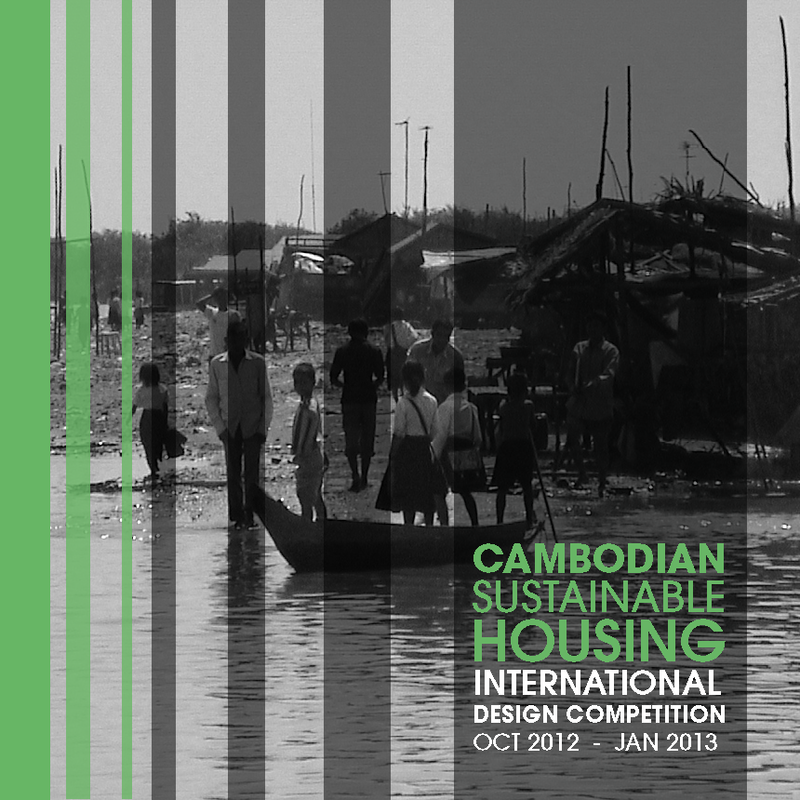 The jury panel day was carried out in Phnom Penh last week with representatives from Building Trust International, Habitat for Humanity Cambodia, Karuna Cambodia, MIT, Collective Studio, members of the Cambodian Society of Architects and most importantly the families that are going to live in the houses once they are built later this year. The jury selection was carried out under complete anonymity, it was very interesting to see that 3 of the short listed student designs came from the same Educational Institution : Tsinghua University in China. I believe that this is due to the fact that through setting a clear and challenging humanitarian design brief to a group of students in the same class will create fantastic results as the students are able to work together to create exciting and innovative design solutions. I hope that in our future competitions we can promote the use of Building Trust design briefs in school curriculum and create powerful design solutions from the young designers and architects of today. If you are interested in setting a design brief to your students or are a student who would like to get your professor thinking about humanitarian design please get in touch. Please note an exhibition showcasing the winning and short listed student and professional designs will be held in Cambodia in May. If you would like to know more about the event, please get in touch. In the professional category, three international architecture firms were announced as joint winners of the competition. 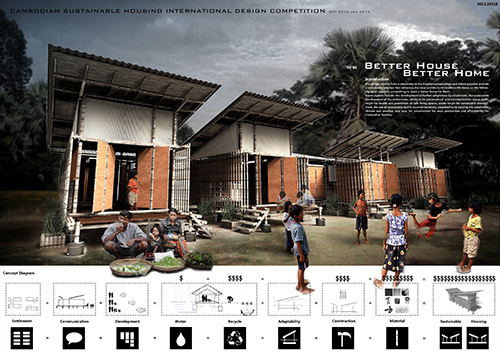 The three winning designs by teams from the UK, Australia and USA will be constructed in partnership with Habitat for Humanity Cambodia in the upcoming months, I look forward to sharing with you images from the build. I am planning to host a rather large fundraiser for Building Trust in London this Summer. After a very successful Halloween Fundraiser in 2011, I am hoping to get a great venue, some fantastic acts and throw a huge night of comedy/music all in aid of Building Trust. 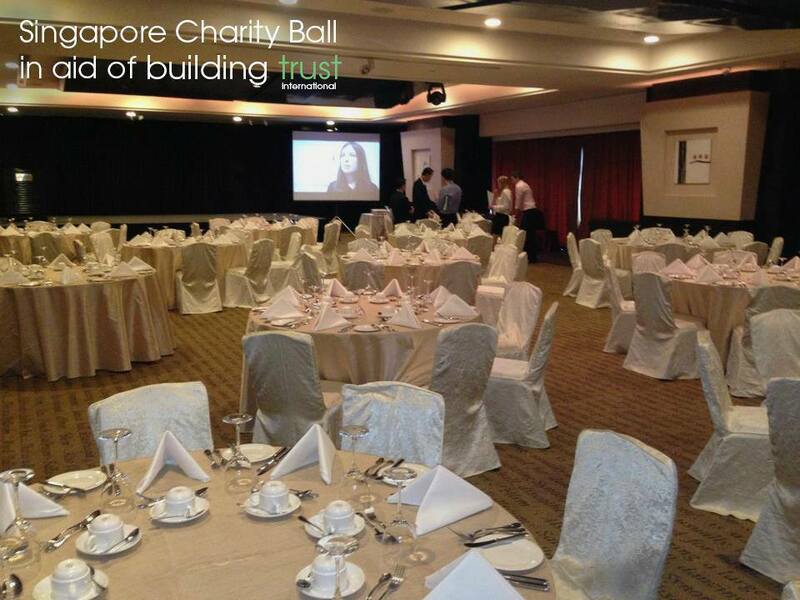 As I currently research venues and recruit performers, I would like to share with you a glamorous night in aid of Building Trust which a very good friend of mine James is putting on in Singapore. 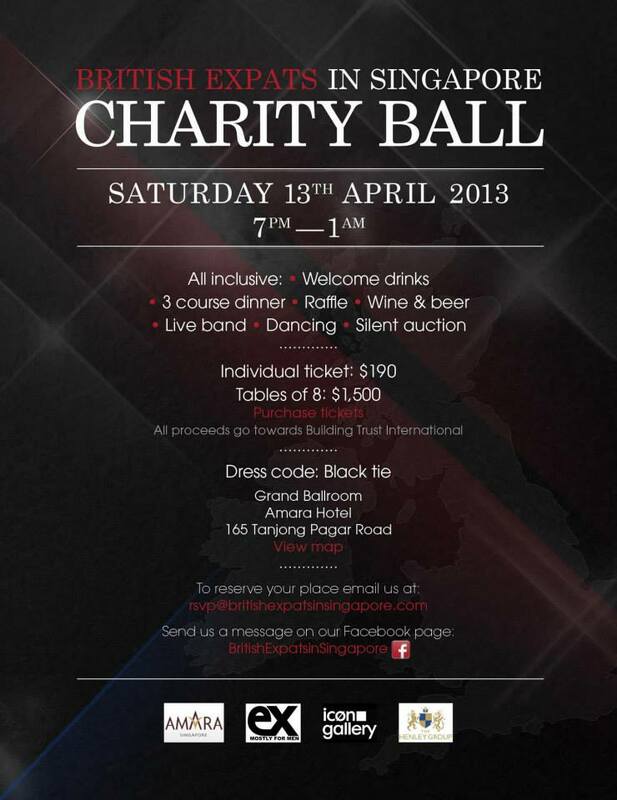 On Saturday 13th April 2013, British Expats in Singapore will be holding a black tie ball with Welcome Drinks, 3 Course Meal (with free-flow wine and beer), Live Entertainment, Dance Floor, Raffle and a Silent Auction. Many thanks to James and all of those involved in helping promote and plan this fantastic event. We cannot wait to hear how the night goes! Moving Schools 001 – The film! I documented in my blog last year about how my very good friend Matt decided to put his faith in Building Trust and spend his holiday from his London city job to spend two weeks filming the school build. 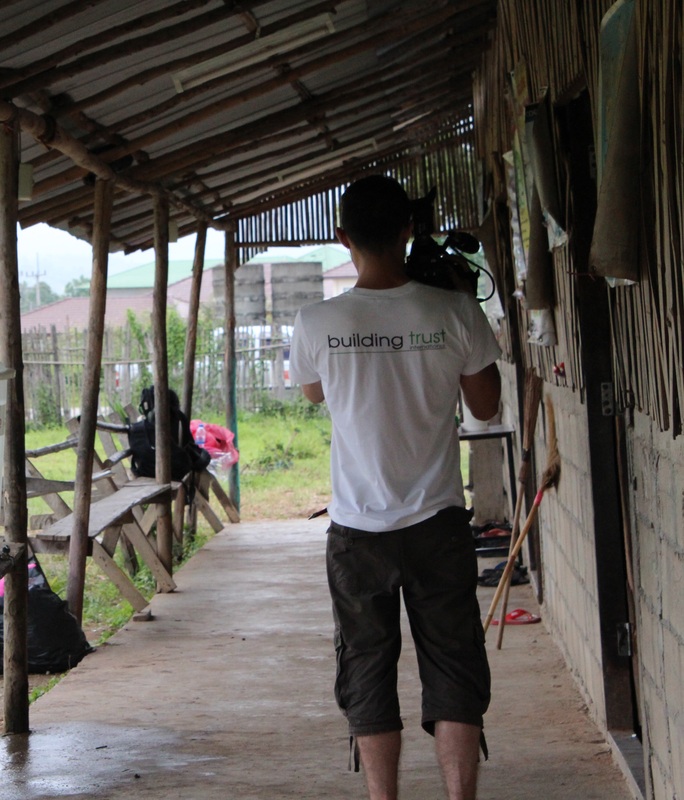 Matt believed in us and travelled for the first time out of Europe to document the Moving Schools build. We were very happy to have Matt with us and it was fantastic that he managed to film the early stages of the build. He was able to capture the arrival of our International set of volunteers and the moment when the Thu Kha Hang Sar headmistress, Chan Chan dug the first foundation hole for the school. After Matt left to go back to his city job (as a film editor) in London, we were lucky enough to have a second camera man on site to film the rest of the build. We met Richard through the team at Youth Connect. Richard was making a film about the young apprentices we had hired to complete the school build. He was documenting the start of their new social enterprise called Iron Wood. Richard very kindly agreed to film the rest of the school build. I am very proud to present a small film promoting Building Trust and documenting our first Moving Schools build. I hope it clearly demonstrates how we operate as an organisation and what we aim to achieve through our humanitarian projects. Many thanks to Matt for editing, filming and creating an amazing film and thanks to Richard for the interviews and additional footage! We are hoping to make a longer film of the Moving Schools project to help further promote Building Trust. 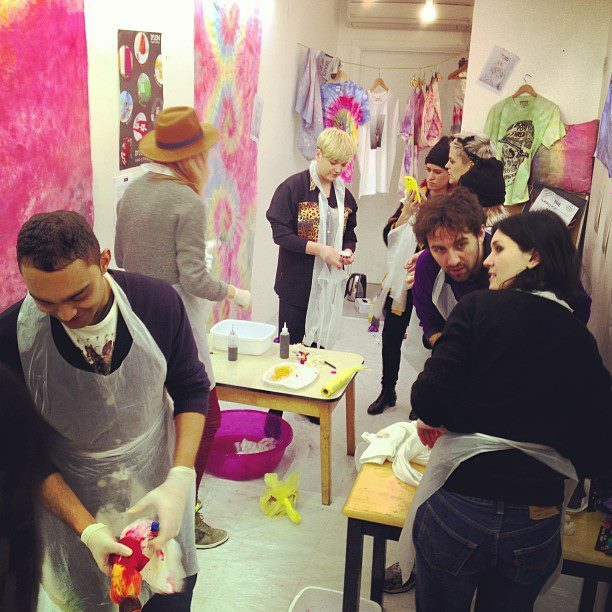 If you know of anyone who may be interested in collaborating with us please do get in touch. In 2007, I graduated from Brunel University with a degree in Industrial design. Since leaving University and setting up Building Trust, I have been lucky to continue my connection with my former University through setting humanitarian project briefs to eager design students. I was thrilled to have been invited by my former Head of Design to be part of the judging panel for a brief set to the students by The James Dyson Foundation. I was very keen to attend the judging day and see the exciting solutions that the very same pupils whom I had set a brief to the previous year had come up with. The same students who had spent weeks coming up with their own solutions to improving the very poor living conditions of migrant workers in Singapore now faced a new design challenge. The James Dyson Foundation aims to “inspire young people to study engineering and become engineers” and encourages “young people to think differently, make mistakes and invent. ” It was great to meet with the fellow jury members and was reassuring to hear that The James Dyson Foundation had very similar aims to Building Trust; promoting design as a tool for social change through connecting with young designers and engineers. Solve a first world problem using an iterative design process. The James Dyson Foundation advised students that 2012 was the UK’s second wettest year on record and also the world’s tenth hottest year. As these trends will continue they felt it was very important that the students tackle these new climate challenges. Students were asked to think about areas such as disaster relief, disaster prevention, damage to houses due to flooding, solutions to problems caused by extreme weather, food crop adaptation due to climate change and water conservation due to drought. It was great to read a challenging brief and I was eager to see the solutions that the students had come up with. Starting at 10am sharp we spent the day reviewing each students submission, carefully checking whether their design fitted the brief. It was interesting to see that many students had focused on similar ideas such as a new iPhone Application to provide traffic advice in an extreme weather scenario or to warn users of a flood. Many students also looked into tackling preventing damage to homes due to flooding with a similar product which blocked off water to the main front door. 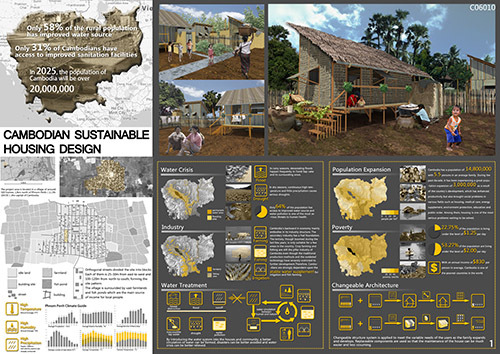 It was fantastic to see how the students had progressed from the previous year and it was obvious to see through their designs how passionate they were about humanitarian design. The most interesting solutions however had read the brief very carefully and created new innovative solutions to many of the areas stated above. I am very happy to share with you the top 5 chosen designs which the selected students will now develop further over the upcoming weeks. In May, The James Dyson Foundation will review the 5 developed projects and choose a winner. The winning design will be given £1500 and runners up will be presented with a Dyson AM04 Fan Heater. 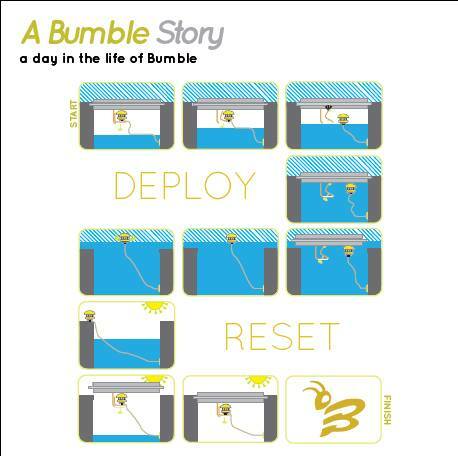 One of the shortlisted 5 designs was by Henry Davies who designed a product entitled ‘Bumble’. Henry came up with a solution to a problem caused by extreme weather. The ‘Bumble’ alerts the public of an open manhole using a water turbine to power and rotate a LED to warn those nearby. ‘Stretcher Chair’ by Matthew Durbin tackled the issue of how emergency services rescue people during emergency situations. The design converts from a flat stretcher to a mobile chair which two people can use to carry a person to safety. Jo Gregory Brough’s app design entitled ‘Navigate’ aims to combat transportation issues when bad weather effects the UK. Users are able to share their experience with other app users to gain a greater knowledge of the road and transport conditions. One of the more technical designs was ‘Deluge’ by D Posner, who decided to tackle flood prevention in the home. The solution to add hydromorphic polymer to the door frame. The polymer would expand when wet and seal the door giving the user added prevention against water damage. ‘Sampan’ by Phongpracha Vadanyakul provides a solution to transporting users who have been injured or trapped by disaster. The rescue raft works on both snow and water and provides an insulated waterproof compartment to prevent users from catching hypothermia. I am sure you will agree that the designs are very innovative and tackle a wide range of solutions to the questions posed in the brief. It is great to see young people thinking about designing for disaster prevention as well as disaster relief. I look forward to sharing with you updated developments of the projects and images of the winning design in May.